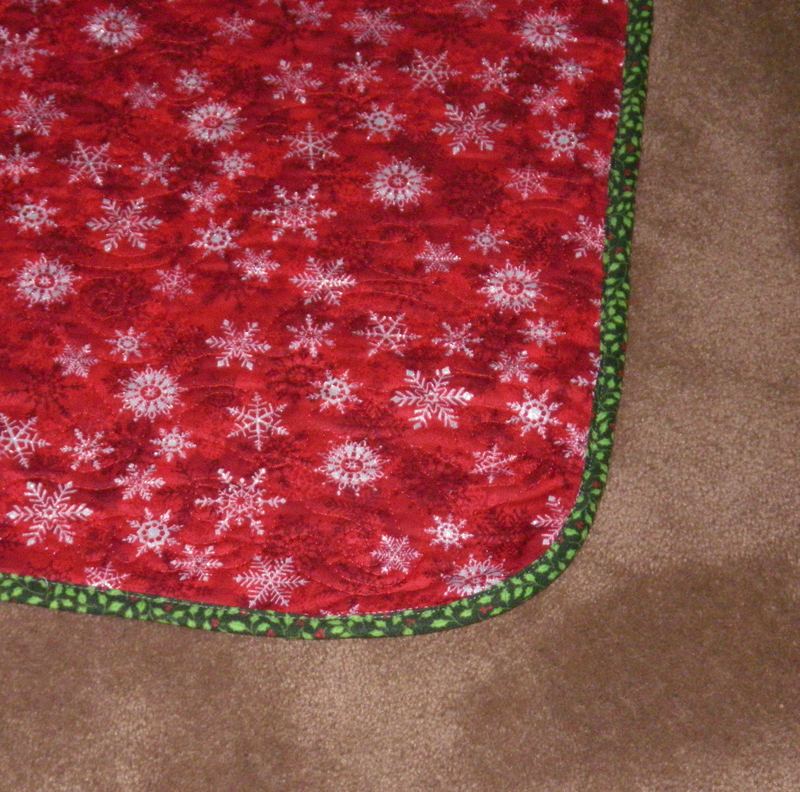 A TGIFF for you today, I finally finished my tree skirt that I started 2 years ago! Just 2 pieces of fabric, stitched together with batting, why did it take me so long? I took the opportunity to practice some new (to me) free motion quilting (FMQ) motifs, but of course you can’t see them because I used matching thread on busy fabric (which could be a good thing…). And the tree is up! And I vacuumed! I made bias binding, so I went ahead and rounded the corners, which looks great. I sewed the binding on by machine — it‘s under the tree and who is going to look anyway? This is my second finish of Q4 inspired by the Finish-A-Long hosted by She Can Quilt (Q4 list here). 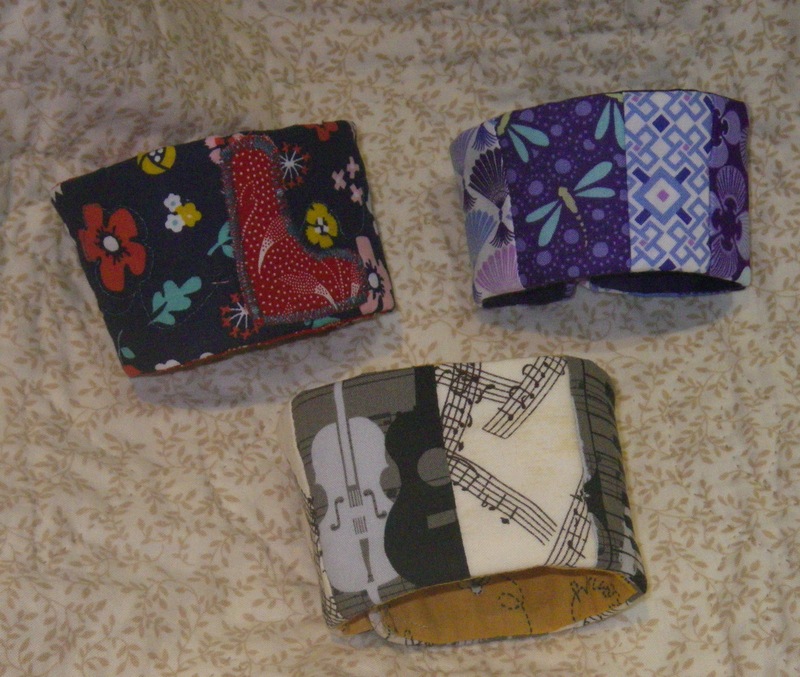 I made some coffee cozies yesterday for teacher gifts using this tutorial from Moda Bakeshop. My daughter, ever the astute one, pointed out that Madame (the French teacher) never brings a coffee cup to school. Not even tea? I asked plaintively. No, she replied with assurance. Darn, back to the drawing board. And yes, I know the music teacher’s cozy looks big, I will test it with a Tim Horton’s take-out coffee before I give it away (for any non-Canadians out there, Tim Horton’s restaurants are ubiquitous–we have 4 in our little town). Linking up to TGIFF at Quokka Quilts. Love the cozies and of course we need 4 Tim’s in Port Hope! I lost count here in Kitchener! BTW cozies can work for cold drinks too! Helps stop condensation. I’m sure the music teacher drinks something…water bottle cozy? I love the curved edges. I want to give it a try but it is a little daunting. My only problem was that my seam allowance wandered a bit on the curves, but the bias binding is definitely forgiving. They will love having those cozies. Pretty tree skirt, too! Perfect call, putting the binding on by machine. I would, too, for this purpose. Perfect for baby quilts, as well. I had some wrinkles on the centre circle, but generally it worked quite well. Thanks! I can tell how much I’ve improved over the course of this project. Very cool finish! all ready for Xmas!